Do you wish your teeth were straighter or not as crooked? Has you child got crooked teeth that need to be straightened? It’s a fact of life that not everyone’s teeth are perfectly straight. But straight teeth don’t just make you look and feel better. When your teeth are straight they’re easier to clean, keep your gums healthy and have less wear and tear. If you think about orthodontics, you may remember someone at school who had traditional braces. Recent advances in orthodontics mean there are now more options available to straighten your teeth other than traditional braces. Traditional metal wired braces have been around for more than 200 years. This method of straightening teeth has evolved over the years improving treatment efficiency and appearance. In our opinion, fixed braces are the most efficient and predictable method to straighten adult teeth. Brackets are small connectors that are individually glued onto the surfaces of the teeth. The brackets hold a U shaped wire designed to apply pressure to straighten the teeth in each jaw. The brackets are most commonly made of metal and also available in tooth colours (ceramic or plastic) or clear (known as clear braces). In some cases, the brackets can be placed on the inner side of the teeth (palate or the tongue/lingual side) making the braces not visible. This is also known as lingual braces and though it is more cosmetic, it’s not suitable for everyone. At Mosman Village Dentistry, Dr David Wing chooses to use the Damon System for fixed braces. This patented advanced technology utilises superior design in its bracket and wire system producing more predictable, more comfortable and often quicker course of treatment. Clear aligners, also known as “invisible braces” do not have wires or brackets to move the teeth. 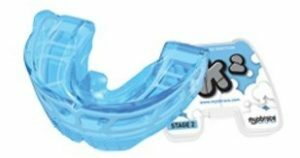 These removable appliances are made out of medical grade clear plastic and feel like a thin mouthguard that go over the entire surface of the teeth. This method of straightening teeth is a relatively new technology and has become popular since the late 1990’s. Invisalign is the most well known brand of clear aligners. Clear aligners are a great cosmetic option for adults who require minimum corrections. In complex cases requiring major corrections, traditional braces offer more predictive treatment in shorter duration. Clear aligners move teeth in small increments by wearing a series of slightly different shaped aligners every two weeks. 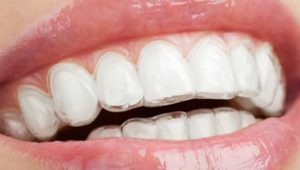 Small white attachments or “bumps” are individually glued on each tooth (much like brackets in traditional braces) to help aligners grip the teeth and move them gradually to ideal position. These aligners can be damaged if not cared for properly and they must be removed before eating. Patient cooperation is important with these removable appliances. If you opt to have clear aligners, you must wear then for at least 22 hours a day for two weeks before moving onto the next aligner. Comfortable: Some level of discomfort is expected with the movement of your teeth. They’re generally more comfortable than traditional braces with wires and brackets. Easy to maintain oral hygiene: You can remove the aligners to brush and floss as normal. Removable: Before playing a musical instrument, playing sports or eating food you can easily remove them. Enamel reduction: If your teeth are crowded, you may need to have a small amount of enamel on either side of the teeth removed to make space. Transient lisp: While you adjust to wearing the aligners, it may sound like you’ve got a lisp. Ongoing corrections during treatment: With traditional braces, it’s relatively easy to make adjustments to the wire and brackets on the teeth. With clear aligners, if the teeth don’t move as expected then course corrections need to be made. This requires taking a new series of moulds to make a new series of aligners with the changes. Myobrace is a no brace approach to straightening teeth. It’s most effective in growing children from ages 6 to 10. Myobrace uses a myofunctional orthodontic technique to treat the underlying causes of crooked teeth. This method of straightening teeth has been widely used around the world for over 50 years. Minimising relapse (teeth moving and becoming crooked again after orthodontic treatment). Myofunctional habits refer to poor oral habits such as thumb sucking, dummy use, forward tongue thrusting (this causes lisping), reverse swallowing (an unnatural way of swallowing) and mouth breathing. These habits are often considered the real causes of mal-aligned or crooked teeth. The Myobrace appliance needs to be worn 1-2 hours during the day and overnight while sleeping. Best results happen in combination with a series of Myofunctional exercises that further help to retrain the tongue and the muscles of the mouth. In some cases, fixed braces may be needed for a short time to finalise optimal alignment of teeth. Why does Myobrace work best in growing children? Orthodontic treatment with Myobrace is most effective in children from ages 6 to 10 as their facial and jawbones are still malleable and developing. By correcting poor oral habits such as thumb sucking and mouth breathing we can eliminate the real causes of crooked teeth and underdeveloped jaws. How does Myobrace differ from other traditional braces? Myobrace treatment is mainly aimed at correcting the causes of crooked teeth and underdeveloped jaws. Eliminating poor oral habits such as thumb sucking and mouth breathing will reinstate correct swallowing pattern, improve breathing and speech. The effect from good oral function is optimum growth and development in the jaws and face. In well-developed jaws and well- proportioned face, there is usually enough room for adult teeth to come through straight with minimal chance of requiring braces. Why choose Mosman Village Dentistry for Orthodontics? Dr David Wing is a general dentist with a special interest in orthodontics. He has had further training in Early Interceptive Orthodontics, Damon Braces System, Dentofacial Orthopaedics and Myobrace. He treats adults, teens and children. Dr Wing has always been fascinated with the mechanisms of realigning or straightening teeth. In fact, it was while he was wearing braces in his teens that he decided he would study dentistry. Dr Wing himself has had 2 courses of braces including a few mishaps and complications along the way. Over the years he has seen many orthodontic cases relapse (teeth moving and crowding again) and began to wonder if there was a better way to provide orthodontic treatments for our patients. This is when he started his journey on investigating modern orthodontic options for best outcomes possible. Dr Wing has helped many of his patients straighten teeth the healthy way. Dr Wing can help you to formulate an orthodontic treatment plan that is suitable for your needs. In some complex cases, he may choose to recommend a specialist orthodontist in the interest of the patient.